"Friends, 20 years ago London hosted a historic concert which called for our freedom... 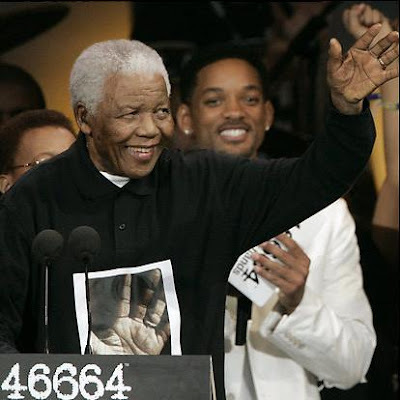 Your voices carried across the water to inspire us in our prison cells far away," So said Nelson Mandela at his 90th birthday party concert held in Hyde Park last night in aid of 46664, the HIV AIDS charity that bears his prison number as its name. Today, he is the world’s leading statesmen. But, in 1988, he was still incarcerated by the evil apartheid regime. His 70th Birthday Tribute Concert was watched by close to a billion people in over 60 countries. It helped galvanise public opinion and to bring an end to that dark period in South Africa’s history. Back then, not everyone was so keen on Nelson Mandela’s release - a group of Tory students gained notoriety by wearing "Hang Mandela" T-shirts and badges. I wonder whatever happened to them? I had the privilege of being in Nelson Mandela's company and then hearing him speak when he came to the Labour Party Conference and became an honorary Labour Party member in 2000. It may sound clichéd but it was a truly uplifting experience. He has a presence unlike any other. His call to fight poverty, disease and injustice was as powerful then as it was last night but it was his optimism that these can all be defeated if we build a movement of people willing to make it happen, which most stayed with me. Last night, speaking slowly but powerfully, Nelson Mandela said "We say tonight after nearly 90 years of life, it is time for new hands to lift the burdens… It is in your hands now." If you want to donate to 46664 then please click here to follow the link. Well, Mr Daniels replied in terms of 'education' and 'good company' and I'm sure that was part of it. But I was looking for a 'change of heart' reply. It's there but it's also a question of speaking about it. Maybe it was a too difficult question. I bought a woven bead bracelet at the meeting with a little mirror on the front so you can see behind you. It straps with velcro but it's a bit small for my wrist. It has Robben Island on the back. If anyone would like it please email rosemary@rosemarypettit.plus.com - and it's yours.